Tickets for Grandstand events may be purchased online, by telephone or at the State Fair Ticket Office on the fairgrounds during special limited-time openings. Please note: State Fair admission is not included in the purchase of Grandstand Concert Series tickets. Customers must purchase admission into the fairgrounds in addition to the Grandstand ticket. Grandstand tickets are available through our official ticketing partner, Etix. Call Etix at 800-514-3849 for tickets. 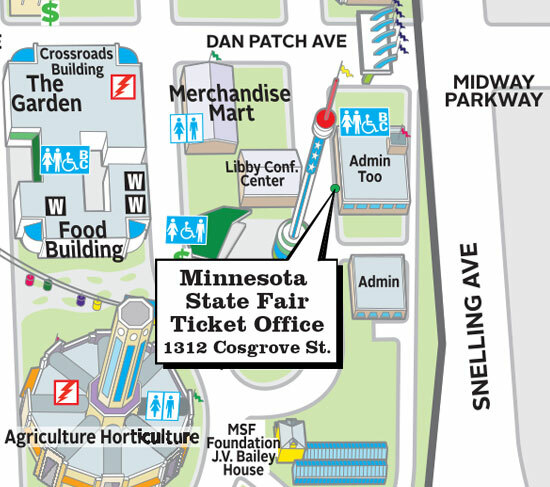 The Minnesota State Fair Ticket Office on the fairgrounds will be open during a special limited-time opening on April 12 until 1 p.m. Please note on-sale times. Tommy James and the Shondells and Happy Together Tour 2019 – on sale at 10 a.m.
Clint Black & Trace Adkins with special guest Terri Clark: Hits. Hats. History. Tour – on sale at 11 a.m.
Grandstand tickets are available in person at the ticket office during special limited-time openings ONLY before it opens for the summer in June. When open, the ticket office is located just inside the fair’s Snelling Avenue main gate (Gate #5) at 1312 Cosgrove St., St. Paul, MN 55108. At Snelling Avenue and Midway Parkway/Dan Patch Avenue, enter the main gate and take a left on Cosgrove Street. The ticket office is located in the red brick building immediately to your left (Admin Too). Free lot and street parking is available.